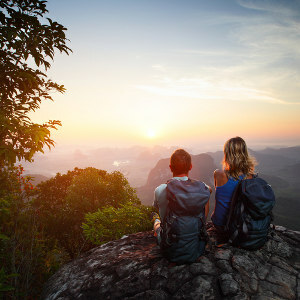 If you need help motivating you to get outdoors, pick a buddy for your outdoor adventures. The icicles have finally melted off the eaves of your home and you no longer have to put on six layers of clothing just to check the mail. Now that summer is here, you're ready to embrace the world outside, but how can you make sure you spend more time with nature this summer? Pick a theme, such as parks or lakes, and make a list of all the destinations in that category within a couple hours' drive of your home. Set a goal to visit one each weekend for the entire summer. To make it a visual quest, pin a map to the wall in your home and put a sticker on each location after you've explored it. Maybe you're terrified of heights or perhaps you're scared of the ocean. Ask your online psychic to help you work through your outdoor-related fears, then decide to confront them this summer. Dip your toe in the Gulf of Mexico or climb the highest hill or mountain in your area. Take baby steps if necessary to keep you within your comfort zone. You see your city every day, but not like you would if you were a first-time visitor. Don the exuberant, rose-colored glasses of a bona fide tourist and explore your city as though it were the first time. Use online tourism websites to find out-of-the-way parks or other outdoor destinations that you'd never otherwise visit. Spending time outdoors and with nature doesn't always mean sweat-inducing activity. Create a welcoming outdoor space at your home to encourage you to spend time outside. Comfortable seating and mellow decor will draw you out of the air-conditioning. Step outside to accomplish tasks you'd normally handle indoors, such as surfing the Internet on your laptop, reading a book, or conducting psychic telephone readings. Don't have the money for a glamping (or even regular camping) trip? No worries. Just create a campground in your own backyard and set your sights on a riveting staycation. Pitch a tent, light the fire pit, roast some s'mores, and tell ghost stories with your loved ones while you relish the calming summer breeze. If you want to spend more time in nature this summer, create a routine that requires you to leave the house. Take a walk every morning before breakfast, throw the ball for your dog after lunch, or take a bike ride in the evenings. Once you establish the habit, you won't want to break it. Many DIY projects require you to be outside. Whether you're spray painting a piece of furniture, planting a vegetable garden, or making your own birdhouses, pursue a DIY hobby for outdoors. Not only will you spend more time with nature, but you'll create beautiful things for your home. The summer months beckon you outside, so don't ignore that siren call. Instead, embrace it in new and inventive ways so you don't miss out on the warm weather.